Last year, Atlas F1 ran a series of articles that investigated the technical areas involved in design, development, and construction of an F1 car. Now, a year later, Will Gray picks up where he left off, and dives deeper into the technical analysis of Formula One. Part C1: "On Track: Track team"
The driver is just one part of a large group putting their heart and soul into each race weekend - a team of engineers and mechanics is assigned to each car at the start of the Grand Prix season, and these guys are the unsung heroes of the race weekend. But it's a tough challenge, and with little sleep had by the boys in the garage, life is less glamorous than television makes out! At the top of the tree sits the team boss, the technical director, and the team's race director. These three are the figureheads for the team, and make sure everything runs smoothly in all areas. The technical director oversees all technical decisions, while the team's operations are organised by the race team manager. In the garage, one becomes two as each driver has his own set of technical people, all fighting to beat the team working on the other car. The group consists of a Race Engineer, a Data Acquisition engineer, Electrical engineers, and a team of mechanics, and although the two separate race teams share data and ideas, the greatest challenge is to beat each other. The driver will form a tight partnership with his Race Engineer and Data Acquisition Engineer, with whom he will discuss the best way in which to set the car up during the practice sessions. Good technical feedback from the driver is essential, and having been out on the track for a number of laps, a driver must be able to remember not only how the car drove, but the exact response through each corner on each lap. 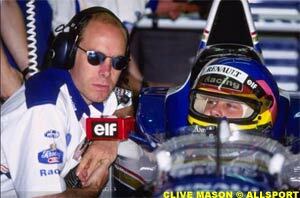 It is quite astounding to hear a good technical driver (such as Damon Hill) discussing his past few laps with his engineer, and making comments such as "on the exit of turn 3, on the fifth lap, I struggled with understeer". To pin point it with that accuracy is essential, for it is the job of the Data Acquisition Engineer to turn this comment into raw data, and eventually a solution, as explained in the telemetry section of this series. Once the solution is made - which tends to be the alteration of rollbar stiffness, or suspension settings, wing angles, or even driver technique - the mechanics will set to work on the car and make the modification. In qualifying sessions, it is important to spot the problem in performance and modify it straight away, while in the race, the data acquisition engineer will constantly scour the data searching for minor problems before they become major ones. In either case, then, it is clearly essential to have good data acquisition engineers, and mechanics who are well trained to change settings rapidly. On the car, all parts have lifeing, and they should be run no longer than their given life. It is the job of the race engineer to ensure all parts that have reached the end of their life are replaced, and between sessions, the mechanics will strip the car down, replace anything necessary, and check all areas of the car for leaks and problems. The electrical engineers will check that the all important electrical systems (such as gear change and clutch operation) are functioning, whilst engineers from the engine suppliers will check and modify the engine mapping if required. During this time, the drivers will discuss set-up changes with the race engineer and data acquisition engineer using telemetry which is always made available to both drivers so that comparisons may be made in search of improvements. Whilst on the track, the men at the top of the technical tree keep in constant contact with the driver through radio headsets. Teams use a number of different radio frequency channels, so that they can talk between themselves without the driver hearing and being distracted, or they can talk to each driver individually. The team is briefed on what channels to use for each type of communication, but sometimes things go awry - for instance, Williams team Director Patrick Head was once on the wrong channel to talk to one of his drivers, and was in fact talking to the other.....just as he began his qualifying lap. Whoops! Sometimes we are privileged to hear the discussions which go on over the radio when teams allow, and one thing is immediately noticeable: The radio is not particularly clear. It can sometimes be extremely crackly, and this can lead to problems when a driver cannot hear the instructions of his team until it is too late. No written information can be passed to the car, so the only way of getting across complicated or secret information is by radio. The other method is the pit-board, hung out over the pit wall on every lap by an engineer, but at 150-odd miles and hour this cannot be the easiest thing to see! Because of this, only simple information is put on it, such as position, time to driver ahead or behind, or information on pitting, temperature problems or other technical information. If the radio packs up, this is the only way of getting information to the driver, and so is an important piece of equipment. In the race, the mechanics have another important job, and one which is often the deciding point of the race - the pit stop. Strategy (worked out by the team's race director and the driver's engineer) will decide before the race how many pit stops are required - the cars only have a certain size fuel tank and cannot usually run non-stop to the end of the race, so at least one stop is always required. Strategies can change throughout the race, and although it's difficult to change the number of fuel stops required unless a safety car or rain interferes with the race, constant consideration is made by the team on the pit wall to decide when to come in. 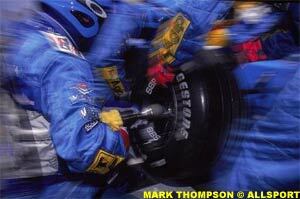 At certain points of the race then, the pit-stop team must be on their toes waiting for the call. When it comes, the pressure is on. The team which comes out into the pit lane comprises of a number of positions - not just mechanics, truckies get involved, and often the man with the lollypop (at the front of the car) is the race team manager. The driver will be directed to his pit by the lollypop man and a man on pit wall, using distinctive, team coloured boards. He must stop precisely, as the team is set up exactly on markings for each wheel and if the driver overshoots, the mechanics will have to shuffle along, costing the team precious seconds. Once he's stopped it's up to the team. Two men, one at the front, one at the back, raise the car using trolleys. Three men work on each wheel, one to work the gun which removes and replaces the wheelnut, one to remove the wheel, and one to put a new one on. If everything goes well, this job can be done in around four seconds. Two more men are responsible for the fuel - one to hold the heavy hose, and one to guide the nozzle into the fuel attachment on the car. This is designed to create a seal once attached, so no fuel can escape. However, sometimes it does, with dramatic consequences. For this reason, all the team members in the pit lane wear fire retardant overalls, and more mechanics stand by behind the main team with fire extinguishers. Once the fuel is in - the timing of which depends on the strategy - the car is dropped to the floor, the lollypop man raises the sign, and the driver speeds away. The crew can relax again! The technical director oversees all technical decisions, and during the race, some minor wing adjustments may be made. He may have to check over the car after a collision, assess the damage, and decide whether the car can continue. The mechanics may be called upon to change a nose cone or make other alterations, and the data acquisition engineers must constantly monitor the cars telemetry to spot possible problems. It's no easy job keeping the car on track. Next Week: "Keeping a watchful eye: Performance Measurement - Telemetry "